The Stone Keep Castle is one of the most commonly recognised forms of Castle. A famous example of a Stone keep is the White Tower in London (Tower of London). 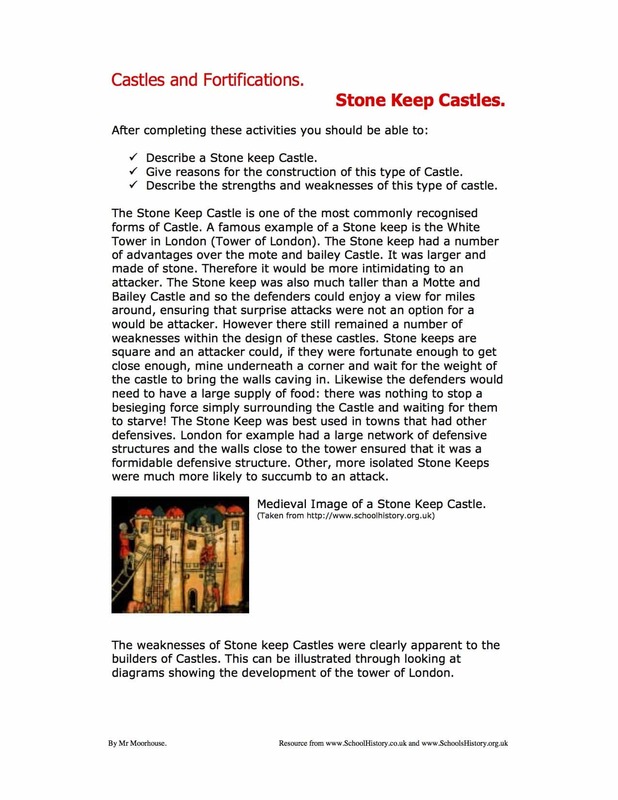 The Stone keep had a number of advantages over the mote and bailey Castle. It was larger and made of stone. Therefore it would be more intimidating to an attacker. The Stone keep was also much taller than a Motte and Bailey Castle and so the defenders could enjoy a view for miles around, ensuring that surprise attacks were not an option for a would be attacker. However there still remained a number of weaknesses within the design of these castles. Stone keeps are square and an attacker could, if they were fortunate enough to get close enough, mine underneath a corner and wait for the weight of the castle to bring the walls caving in. Likewise the defenders would need to have a large supply of food: there was nothing to stop a besieging force simply surrounding the Castle and waiting for them to starve! The Stone Keep was best used in towns that had other defensives. London for example had a large network of defensive structures and the walls close to the tower ensured that it was a formidable defensive structure. Other, more isolated Stone Keeps were much more likely to succumb to an attack. Structured study guide and challenging questions.